I was looking for a short, moderate solo in the area, and while I had already done Emerson’s southeast face, that was in the pre-weblog days. The route is a good first 5th-class solo, fun enough to deserve a repeat and a write-up. 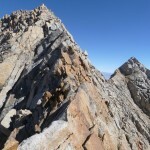 While it is rated 5.4, it is a much less intimidating solo than other similarly-rated routes like Eichorn Pinnacle and the Upper Exum on the Grand. The hardest climbing is all in the first 1-2 pitches off the talus. That is followed by lots of class 2-4 rubble, ramps, and face climbing (take your pick). 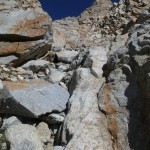 The route finishes along a fun ridge with a sharp but easy knife-edge. Seeing the frost on other cars, I huddled in my sleeping bag and waited for the sun to be well up before hiking the road from the North Lake pack station to the trailhead. It may only be late August, but it is already freezing at night up high. I was still feeling lethargic on the hike, but found energy after leaving the trail. I chose a good approach this time, taking off just past the gully leading directly to the black stain marking the start of the route, and picking up a faint use trail. 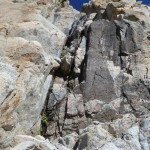 The first section, up through the black-stained chimney, is the crux. 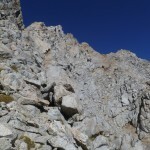 Being in a watercourse, many of the rocks are smooth and rounded, but there are enough edges and dishes to make the climb secure with a bit of patience. 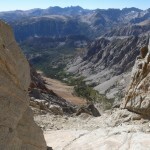 Once the gully broadens, the climbing eases and a variety of lines are possible. 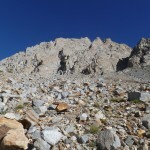 It is often possible to make the climb fast and dull by trudging up sand or rubble, but there are usually fun class 3-4 options on either side of the gully. 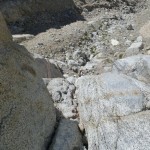 While there are several tempting ramps leading left and right, it is best to stay in or near the gully itself. Heading too far right once, I had to backtrack a bit when the face became uncomfortably smooth and the gully wall too steep. 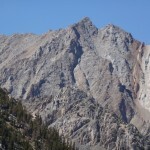 The route eventually tops out in a notch, with views north to Emerson’s east ridge and east to the Piute Crags. From there, it follows ledges on the right side of the curving southeast ridge to the crest. More fun 3rd class climbing, including a sharp knife-edge with plenty of good hands and feet, leads to the summit. From the base of the real climbing, the route took me a bit over an hour. 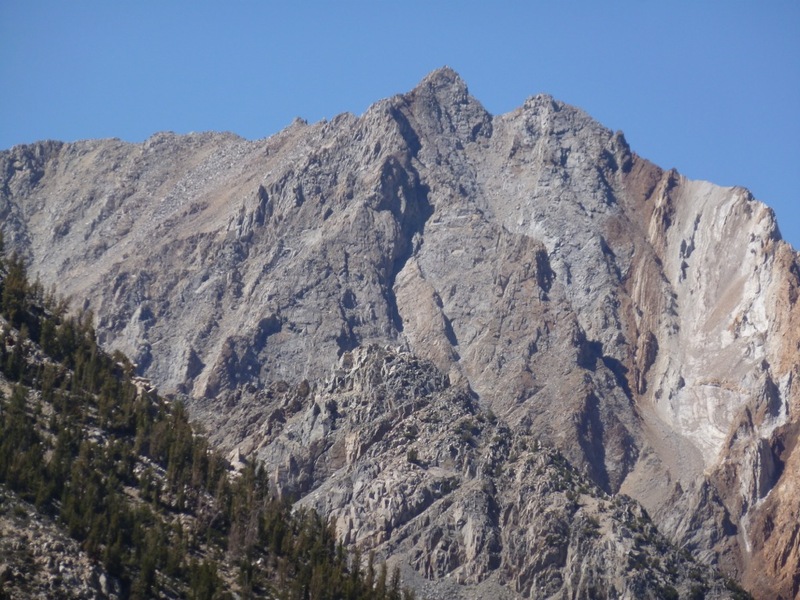 After some quality summit time — the Piute Crags may have crappy rock, but they sure look nice! — I bumbled my way down the south face to the trail. 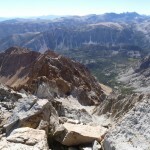 If you descend near the summit and stay toward the east side of the broad, curving face, you will pick up a sandy use trail, making the descent much less painful. Short day accomplished.